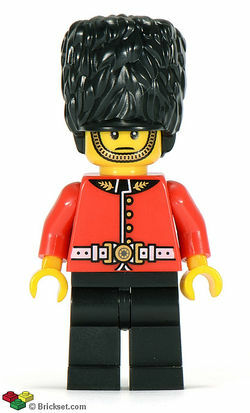 The Royal Guard is a Collectable Minifigure set released in 2011 as one of the sixteen minifigures from 8805 Minifigures Series 5. He has a brown rifle and wears a black bearskin hat, known as a shako. He has a red torso and black legs. He has a very serious expression on his face. His face is printed with a headstrap, similar to the Rebel Trooper from Star Wars. These are the guards who stand outside Buckingham Palace in London, England. This is a description taken from LEGO.com. Please do not modify it. (visit this item's product page) The steadfast Royal Guard is utterly devoted to his job as a protector of the palace and the royal family. In rain or shine, in hot summer sun or freezing winter night, he can always be found standing at his post at perfect attention, staring straight ahead with his tall, furry hat on his head and his ceremonial rifle in place at his shoulder. Facts about "Royal Guard (Minifigures)"
The steadfast Royal Guard is utterly devoted to his job as a protector of the palace and the royal family. In rain or shine, in hot summer sun or freezing winter night, he can always be found standing at his post at perfect attention, staring straight ahead with his tall, furry hat on his head and his ceremonial rifle in place at his shoulder. No matter how much you try to distract the Royal Guard, he’ll never even blink an eye. You can tell him jokes, dress up in silly costumes and even try to tickle him, but he won’t move at all. He and his fellow guards are silent, stalwart sentinels, never uttering a word aloud – and that’s exactly what he’ll tell you if you ask him! This page was last edited on 23 July 2017, at 21:44.